Josh Trivett, Owner of Moonstruck Management, and Penni McDaniel, Owner of Hope River Entertainment are proud to announce they are merging the agencies under the Moonstruck Management name. “I am so excited about the merger of Moonstruck Management and Hope River Entertainment on so many levels. Penni McDaniel is a wonderful veteran of the industry in all aspects: Booking, PR, Album & Radio Promotions. With the recent hire of Ben Wilson as Booking Agent, and now adding all of Hope River’s services under the Moonstruck umbrella, this fulfills my original vision. Moonstruck Management will be a full service agency that offers artists an entire gamut of services needed to build or advance their career,” said Trivett. Johnson City, TN -- Moonstruck Management is proud to announce the addition of Ben Wilson as a new Artist Booking Agent with the agency. “I am very excited about the addition of Ben Wilson to Moonstruck. In the evolution and expansion of a business, it is critical to have the right personnel in place to execute the vision of a business model. Ben has a vast amount of experience being the Executive Director of the famed Uncle Dave Macon Days Festival, both in how to work with artists directly, and also contract negotiations. His genuine personality combined with true passion for the music and business is the perfect mentality. I am excited about the new developments within Moonstruck and the future that lies ahead for our team,” says Owner Josh Trivett. Nashville, TN --- NewTown has inked a new business relationship with Moonstruck Management, the booking and management firm that handles stellar bluegrass acts including Dr. Ralph Stanley, Russell Moore & IIIrd Tyme Out and Lonesome River Band. The dynamic NewTown band from Lexington, KY is led by gifted fiddler and singer, Kati Penn-Williams and husband, Jr. Williams. NewTown is a dynamic band that delivers a truly creative musical blend of the traditional and the modern in its acoustic artistry. Nashville, TN -- A multi-award-winning old-time band, The HogSlop String Band has signed with Moonstruck Management for management and booking. Headed by Josh Trivett, Moonstruck has an impressive client roster that includes notable and award-winning acts such as: Dr. Ralph Stanley, Russell Moore & IIIrd Tyme Out, Lonesome River Band, The Roys, Adkins & Loudermilk and former clients like Doyle Lawson & Quicksilver, Bobby Osborne and more. The Moonstruck team is focused on a deep appreciation for Bluegrass, folk and old-time string music. Nashville, TN -- Grand Ole Opry star and multiple Grammy-winner Ralph Stanley has signed to Moonstruck Management for management and booking. Headed by Josh Trivett and Peter Keiser, Moonstruck has a client roster that also includes Russell Moore & IIIrd Tyme Out, Lonesome River Band, Bobby Osborne & The Rocky Top X-Press and Sleepy Man Banjo Boys, among other award-winning groups. Nashville, TN -- Rural Rhythm Records is proud to announce they have signed Dave Adkins & Republik Steele to the label. A new single, "That's Just The Way I Roll" written by Tim Stafford, Steve Gulley and Terry Herd, will be released to radio later this month. The song is the title track of their upcoming new album scheduled for release early 2013. The band has also signed with Josh Trivett and Peter Keiser of Moonstruck Management for exclusive booking and management representation. Nashville, TN -- September 26th will find two outstanding bluegrass music groups celebrating their anniversaries. Moonstruck Management is proud to present an Anniversary Evening celebrating Russell Moore & IIIrd Tyme Out’s 20th Anniversary and Lonesome River Band’s 30th Anniversary. This once in a lifetime event will be held September 26, 2012 at 9:30 pm at Jimmy Buffett’s Margaritaville Nashville located at 322 Broadway, Nashville, TN 37201. Nashville, TN (August 23, 2012) - Moonstruck Management is proud to announce they have signed Sleepy Man Banjo Boys for exclusive booking and management representation. Brothers Jonny, Robbie, and Tommy Mizzone became a viral sensation last winter sparking a whirlwind year that included performances on The Late Show with David Letterman, NBC’s Today Show, The Grand Ole Opry and many more. Nashville, TN (July 19, 2012) Moonstruck Management is proud to present an Anniversary Evening celebrating Russell Moore & IIIrd Tyme Out’s 20th Anniversary and Lonesome River Band’s (LRB) 30th Anniversary. This once in a lifetime event will be held September 26, 2012 at 9:30 pm at Jimmy Buffett’s Margaritaville Nashville located at 322 Broadway, Nashville, TN 37201. Nashville, TN -- Josh Trivett and Peter Keiser with Moonstruck Management are proud to announce they have signed Grand Ole Opry star, Bobby Osborne for exclusive booking and management representation. "What an honor it was receiving news that the legendary Bobby Osborne was interested in working with us at Moonstruck! Bobby has been one of the great legends over the last several decades in the country and bluegrass worlds. His tenor singing is one of the most recognizable voices in the history of the music. We were thrilled to accept this opportunity to work with a Grand Ole Opry member and a legend,” said Josh Trivett. Moonstruck Management is a modern music management company that focuses on the country and bluegrass music business, incorporating artist development, management, growth, and booking into one controlled business. 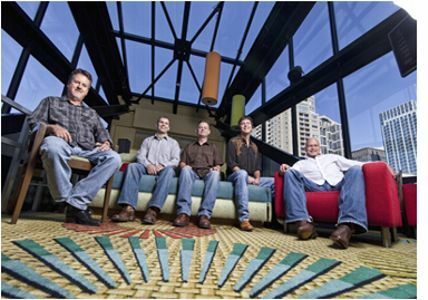 Nashville, TN (March 7 2012) -- Lonesome River Band is proud to announce they have signed with Josh Trivett and Peter Keiser of Moonstruck Management for exclusive booking and management representation. "We are so excited to form this partnership with the Lonesome River Band. The 30 year history and legacy of LRB is a huge piece of the story board of bluegrass music. The progressive style of LRB has always kept them at the unique cutting edge of the genre, and created albums that will stand the test of time. We are excited about 2012 being the 30th anniversary and the future together of Moonstruck Management and the Lonesome River Band as a team,” said Josh Trivett.